Have you ever lost a really important file when your computer has a catastrophe? If you can answer yes to that question then you know how painful it is when you realise that file is lost forever. If you answer no then it's a likely bet that one day, maybe not today, maybe not tomorrow, but one day you will experience that loss and it could be quite painful. To put things in the simplest of terms, to avoid losing a file, have a copy. That though is only half the answer. You need to have another copy stored somewhere that the original file is not. So, if your hard drive crashes on your computer then you don't want your copy to be on the same hard drive because it's as lost as the original. It might be possible to recover files on a corrupted hard drive but what if it's stolen, lost or is subject to some other equally awful event? Your files, especially your images may well be business assets and should be protected from loss. To give you an idea of capacities, a hard drive in a typical laptop you buy now (2015) will likely have a storage capacity of at least 1tb. If you can grasp that these units refer to data storage capacities, the rest of the article should make some sense and we'll try to avoid anything too geeky. So you can see a tb is the largest unit we are going to discuss in this article. Also, when we refer to a file we of course mean a photo file but really you can apply this logic to any of your critical files such as spreadsheets, music,letters or sany other files you create and store on your computer. Lets take a look at how we can avoid the data-loss grief and make some copies. You can buy a 32TB USB stick for £9 in the UK, that's some cheap storage right there. If you only have a few files to back up, a USB stick, memory stick or flash drive as they are sometimes called, offer a very cheap and portable backup solution. If you had no other solution using a USB stick plugged in to a USB socket on your computer would give you some cheap file security and means there's no excuse for not ensuring your critical files are backed up. The downsides to using these is their size, both physically and storage capacity. It can be very easy to lose one as they're so tiny. Whilst 32gb or 64gb sounds like a lot of storage, photo files start to pile up the gb's and if you start to back up video then 64gb is going to get eaten up very quickly. 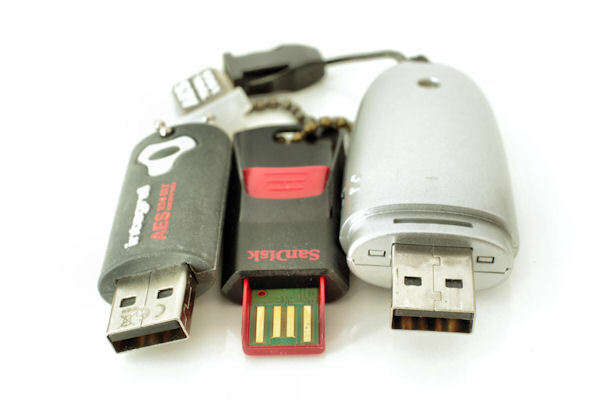 So USB sticks are good for small numbers of files, are cheap to buy and very portable portable but are short on space when you have a lot of files to backup and easily lost. External hard drives offer some real capacity for storage as even the smallest and cheapest, around £50/$50-$60, start at 1TB. These drives connect via USB to your computer and offer a convenient and high capacity storage solution. Most now come with USB 3.0 capability so as long as your computer also has USB 3.0 you can expect some really quick file transfers. They're also backwards compatible to USB 2.0 so you can still use them to back up from older computers, just expect slightly slower file transfer rates. If you are an Apple user then you have a choice of Thunderbolt or firewire on older machines as well as USB drives. However you need to ensure the external drive you buy has the correct connecting interface for your Apple device. You can take your external storage a step further by investing in a Network Attached Storage unit (NAS for short). 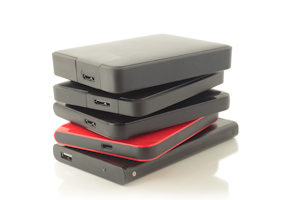 These are backup devices connected to a local computer network and contain a number of hard drives giving a very high capacity for storage. They can also be configured so that the drives are mirrored, copying the same data to different drives so should one drive fail, the data is always available on the other drive. Of course these are more expensive but they do make the files available to everyone connected to the network and offer greater security. However as they are likely to be in the same physical location as your computer there are risks from fire or theft. For the ultimate security, mirroring data offsite offers perhaps the greatest security of all. Storing your files in the 'cloud' means transferring them via a fast connection such as a broadband or 4G connection from your computer to a host on the Internet like Dropbox® or iCloud® by Apple®. Storing your files online means you can access them at any time from any device that allows you to access the host's site. The beauty of using these systems is that you don't have to worry about maintaining the hardware to store those files, someone else takes care of that for you. However this convenience may also be one of the Cloud's biggest issues because you aren't in control of where your files are, you need an Internet connection to get to them and can you be sure they are secure? You also have to pay for some of these services if you decide you need to go beyond their free storage threshold. Before using Cloud backup you have to weigh up the advantages and disadvatages of using these storage systems. You can buy memory sticks and external hard drives with or without encryption . If you are concerned about the security of your files on what are easily lost or stolen devices then encrypting your data is probably the way to go. You are likely to pay a little more for an encryption option but it does give you added peace of mind. Encrypted devices require a password to be entered before you can access the secured data and to ensure the data is protected most devices allow a limited number of failed password attempts before the data is erased completely with no chance of recovery so choose your passwords carefully. The number of failed attempts can be as low as 6. In some countries data protection laws may require businesses to encrypt personal information so this should be considered when deciding upon a backup solution. You should check the law in your country. Having a second copy of a file is easy to achieve however this can get quite complicated when you are managing hundreds or as is more likely, thousands of files in your backup solutions. When you purchase a backup device or subscribe to an online service they sometimes come with automatic backup software which works in the background on your computer taking care of backing up your files. Everytime a file is amended the software will take a copy. This can make it very easy to keep your files backed up with little intervention required. Maybe checking every now and again that you do have a second copy would be prudent. Discovering after a disaster that the backup hasn't actually worked is as bad as not bothering to back up in the first place. You can of course make your own decisions about what and when you back up. This method does require some discipline to regularly copy your files and to keep a track of where they are. Having files backed up is to be recommended but also being able to find them again amongst the thousands of files you might be copying is also important. Adding additional meaningful names to files and folders will help with searching for them when you wish to retrieve a file. I always back up my raw files separately to the edited TIF's and JPG's. I rename the folders of the raw files to something meaningful that I can search for months or years later when I wish to find them again. I also add 'to back up' to the end of the folder name so I know that I have to back it up. Once I have backed it up I move the folder to another folder called 'backed up' where I know I can delete the contents if I wish as I know that I've backed the files up securely. I have at least two copies of all my files on at least two different external drives. When I return from a shoot for a client I always retain all of the images on my CF cards until I have loaded them on to my computer AND I have a second copy on an external drive. Think, if you removed them from your memory card and you only had a copy on your computer's hard drive, which then crashed, what would you do? You can never have enough backups! Boring as they are, backing up your important files will save you pain and misery when disaster strikes. There are a number of solutions and each one has advantages and disadvantages. Some thought is required as to what you would like to achieve with your backup solutions. Perhaps a mix of solutions would be best with some files backed up to the cloud and some on a local external drive or USB stick. Having multiple copies of the same file across different backup solutions will be a very safe option. Laws may govern how personal data has to be backed up and secured so encryption should be considered when deciding upon any backup method. It's worth doing regular test restores to confirm that backed up files are still available. Remember that even your backup devices can fail so always have at least two copies of your files so a single disaster doesn't mean you lose everything.